Your business has capitalized on managed cloud services to host many of your IT workloads. Now, you need to expand your cloud IT deployments further with public cloud services using Amazon Web Services or Microsoft Azure to scale cloud computing and storage resources to meet growing IT business demands. Suddenly, you have data center and cloud environments to manage to ensure your sensitive data remains protected and secure across your cloud providers. 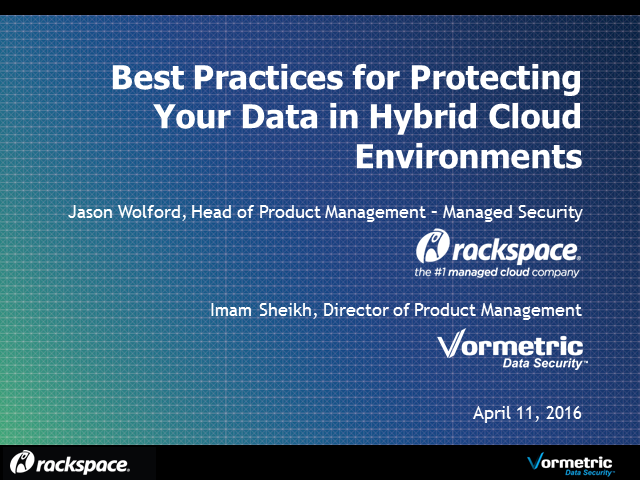 How do you get the most out of each of your cloud environments while maintaining control and protection of your sensitive data? Learn how a comprehensive cloud data protection solution will allow you to meet your data protection and compliance requirements across your private, public and hybrid cloud environments. You’ll find ways to centralize your security controls to efficiently and effectively implement the data security solution to fit your business operational needs consistently in a hybrid cloud environment.